Is there any way I can get High Caliber and Dreadnought with a lot more certainty? (Without a super heal British BB as I don't have one?) Trying to complete the 4th part of the North Cape campaign for the Duke of York, but I'm stuck on this part. Can't really get either, the only times I ever win them are more by luck than anything. Also, any tips for finishing the 5th part of the campaign once I manage this one? Seems rather difficult to do... My only high tier destroyer is Mahan, so doing 90k torpedo damage in one battle is, well, not something I've ever done before. My only British cruiser is the Leander, so hitting 11 torps with that will be incredibly difficult. 75,000 XP is quite a lot for only 2 stars, and destroying 10 battleships is going to take a lot of battles for only 1 star. Any suggestions for completing this part? I'll have about 10 hours to complete these two parts so time is obviously a problem. The XP missions that are the final tasks I can complete rather quickly though (Maybe 1 hour each, more or less depending on how nice matchmaking is), thanks to camos and special signals. Just need to find a way to complete the things listed above. British bb's and let it burn for a while. 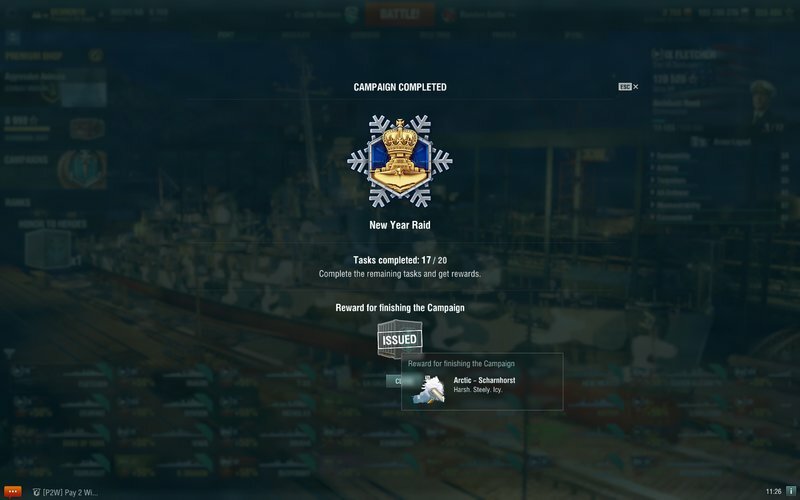 do the torps with emerald and kill BB's with them have premium time and work at the 75000 with signals and you can buy the 125 doubloon camo 200@ XP, GL. High Caliber and Dreadnought is easy in ranked if you aren't a vegetable. I got multiple over the last few days with my Bismarck (long after I completed the campaign though ... didn't want to start ranked until mission 5 because of the premium day ranked reward). You can complete same mission multiple times for the stars though so have multiple missions active but focus on what you do best. Don't have to do all the missions. you can repeat the missions for stars. Thanks for the help, I'll try taking my NC into ranked and see if I can pull those off there, haven't tried it yet. The 45k XP mission isn't too much of a problem, I stockpile things for situations like this. I've been pulling 12k to 15k XP per game when I spam every XP boost I have, and I should still have enough left to get through the 40k and 45k XP missions. I really don't think I can pull off 11 torp hits with the Leander, don't think I've ever had that many hits in a cruiser before. The commander is only 7 points so no concealment expert either. I may give it a try though. just repeat the XP missions. You can get more of the DoY boxes after getting DoY. Thank god I finally fished today , but just repeat the xp missions. I skipped them to get in before the end date.